Manual visual inspection, shortly as MVI, is a method to detect defects in digital circuits by naked eye, magnifier and microscope in SMT production. In the manual visual inspection, you can also make a comprehensive judgment with the help of metal needles or bamboo toothpicks, and with appropriate force and speed across the QFP pins. In addition, MVI has a good effect in checking whether the IC pin has pseudo soldering or bridge connection. 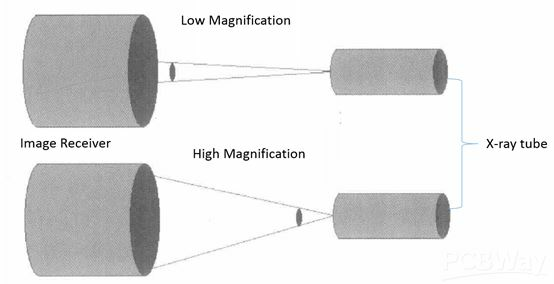 MVI with the aid of magnifying glass and microscope is flexible and also the most basic inspection method. However, MVI has been unable to adapt to PCBs of moderate complexity, and it is neither reliable nor economical, which is now tending to be eliminated. ICT is a contact detection technology, and is also one of the most basic methods for testing in production. It is widely used because of its strong fault diagnosis ability. Usually the SMA is placed on a specially designed pin bed clamp. The spring test probe installed on the fixture contacts the leads of the components or the test pad. As it contacts all the networks on the PCB board, all the analog and digital components can be tested separately and fault components can be quickly diagnosed. ICT can detect almost all manufacturing process defects and accurately identify defective components. For example, the detection of soldering defects can include bridging of solder joint, excessive solder, pseudo soldering, wire breakage and so on. The detection of defects of components includes resistance value, component loss, wrong sign of polarity, capacitance, diode, audion, IC device and so on. ICT test system is powerful, fast and stable. Due to the development of IC technology, its integration degree is getting higher and higher, and its internal function and complexity will be greatly improved, and the I/O interface will also increase accordingly. In order to test effectively, PCB should have as many test points as possible. In order to ensure sufficient coverage of test points and reduce the complexity of the needle bed, several methods for testing super-large scale integration blocks have emerged. For example, with the intrusion improvement of the chip's integration level and testing of print circuit board, the application of boundary scan test technology and non-vector detection technology become wider and wider in testing ICs. 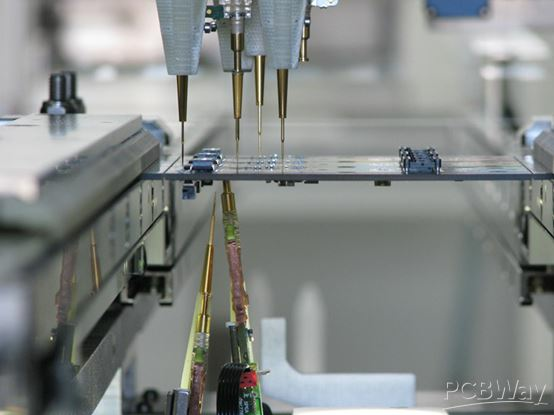 With the extensive use of BGA, CSP and other components, the traditional detection technology has been unable to work because the solder joints of these components is hidden under the SPBGA. Therefore, AXI detection technology is emerging to meet new challenges. After the printed circuit board assembly (PCBA) enters the machine along the guide rail, there is an X-ray transmitter tube above the circuit board. After the X-ray emitted by it passes through the circuit board, it will be received by the detector below, as shown in figure 3. The solder joint contains lead, which can absorb large amounts of x-rays. Compared with x-rays passing through glass fibers, copper, silicon, and other materials, x-rays irradiated at the solder joint are absorbed in great quantities, and black spots are formed at the solder joint, resulting in a good image, which makes the analysis of the solder joint quite intuitive. Therefore, a simple image analysis algorithm can automatically and reliably test the solder defect. AXI detection technology has experienced the evolution from 2D test to 3D test. 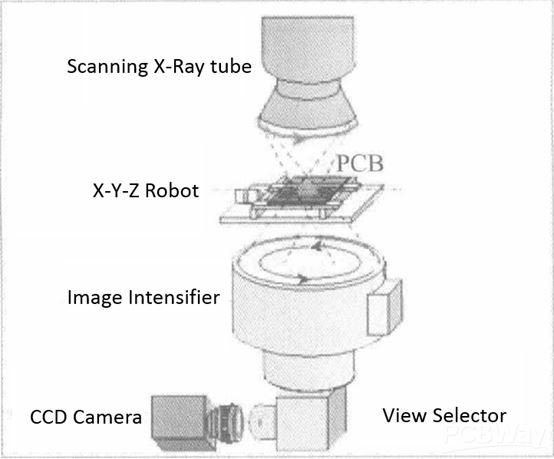 The former is the radiographic X-ray test method, which can produce clean image for the solder joints on the single-PCB, but the inspection effect for the double-PCB is very poor, which will make the visual images of the two solder joints overlapped so that it is extremely difficult to distinguish. The 3D test, however, uses a layering technique, in which the light beam is concentrated on any layer and the image is projected onto a high-speed rotating receiving surface. Because the high speed rotation of the receiving surface makes the image at the focus very clear, while the image on other layers is eliminated, the 3D inspection method can independently image the solder joints on both sides of the circuit board. 3D X-ray detection technology can not only test double SMT circuit board, can also for those multilayer PCB which do not have visible solder joints, such as BGA, use "slices" detection, which can make a thorough inspection on the top, middle and bottom of the solder joints, at the same time, also using this method can detect through-hole solder joints, check whether the solder in the hole is full, so as to greatly improve the quality of solder joint connection.